SOFT AND SAFE: The Squeak 'N Stack Blocks are the perfect option if you want your baby to have blocks without the heavy and sharp traditional ones. They're soft enough to be squeezed, making a squeak sound, but also firm enough to be stacked easily atop one another. EASY CLEAN UP: These blocks are made of vinyl and simply wipe clean to keep all your baby's favorite toys clean and sanitary. They also come with a vinyl zippered case. When playtime is over, just pack them up and put them away to keep your home neat and tidy. PRODUCT SPECIFICATIONS: Package contains (1) Earlyears Squeak 'N Stack Blocks Set. 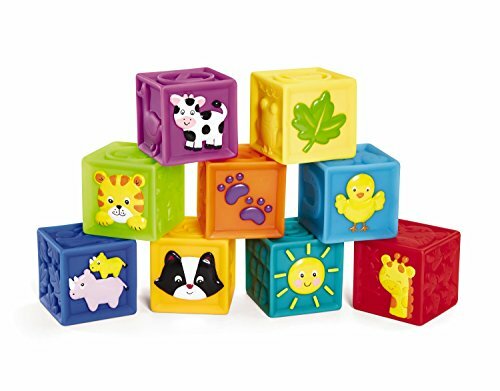 Includes 9 soft squeaky blocks with embossed pictures. Made of phthalate free vinyl. Includes clean vinyl zippered pouch for easy storage and transportation. Suitable for babies ages 6 to 24 months.